Today, my guest post is from historical novelist Hazel Wood, who’s dropped by to discuss one of my favorite topics: culture clash. 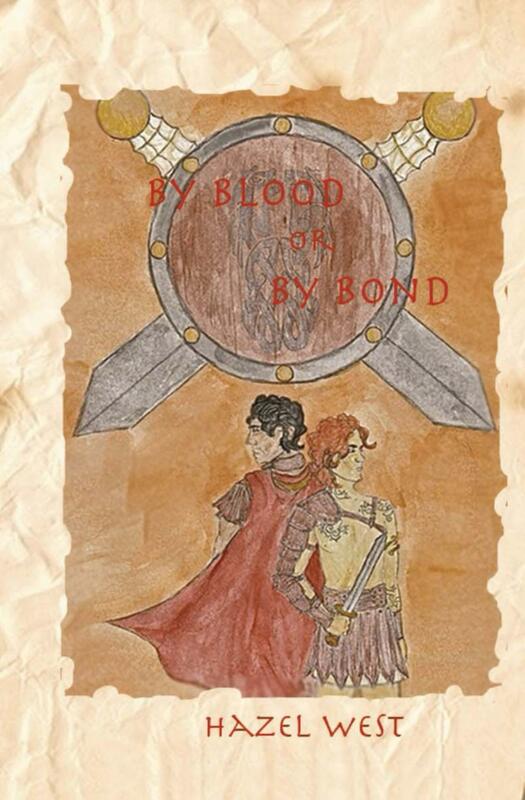 In my novel By Blood or By Bond I explore the differences between the Roman and the Celtic/British culture. My two protagonists are Caolán, the son of a Celtic chieftain, and Viggo, a centurion in the Roman army. I’ve always been a fan of exploring different cultures and showing how their differences can affect people’s relationships, for good or bad. The Celtic culture, to me, has a wild sophistication. It is not advanced and glorious like the Romans with their class systems, and large marble buildings and advanced government and all, but the Celts are a beautiful people. I think of them quite like the Native American tribes, who I always thought were sophisticated too, though not, perhaps in the eyes of everyone. But despite the rough appearance of the Celts’ living conditions they were a proud race, and were very intelligent people, despite what the Romans liked to think. They were great warriors and superb riders, and the tribes had a very strong familial tie. I think if they had adopted the Roman style of fighting, they would have won all the battles fought on determination alone. The Romans might even be considered more barbarians than the Celts in some instances. The Romans were definitely fond of their blood sports. Today, we think it was completely barbaric, but that was the world back then. It would have been no different than us watching the staged wrestling matches today. It can also not be overlooked how much influence the Romans have had on the world. Researching for this book, I realiz! ed just how much has come down to us from the Roman culture from the government, and armies, and many other things. Writing this book was rather interesting, because I don’t really agree with a lot of the things the Romans did, and I felt there were probably Romans who felt the same even back then. Well, there most likely were, considering how many emperors were murdered! We have to face the fact that a ‘perfect Roman’ would hardly be a very likable hero. Thus, Viggo is called in the book ‘hardly the perfect Roman, but perhaps a better man because of it’. He is a rebel, a lover of true justice, and probably would have been looked down upon because of it, which he is in the book. Caolán, on the other hand, is definitely Celtic. Another reason I wanted to cast a Roman character as less than the perfect Roman is because he needed to be able to view Caolán with not just dismissive disdain because he was a ‘barbarian’. Of course, events in the story make their relationship hardly friendly, but Viggo still has the ability to look deeper than just Caolán’s nationality. Though that view might be helped on a bit by a certain female character! There are few cultures that are more different than the Celtic and Roman ones, and yet, when you actually look into them, they have many similarities such as determination and pride of country and culture. The Romans wanted to make everyone Roman, but the Celts would not bend and they were the only people ever able to resist Rome. It’s definitely something to consider when thinking about the two cultures! Which ties are stronger—those of Blood or those of Bond. Caolán, the son of a Celtic chieftain, awaits his first pitched battle against the Roman invaders, knowing that this is the moment in which he will truly become a warrior, of the tribe. Viggo Callias is a seasoned centurion in the Roman army on his first deployment to Britain with his newly enlisted son, Aulus. Serving under an incompetent commander, he wonders whether victory will be theirs. But fate takes a hand in both Caolán and Viggo’s lives when Viggo’s son is killed by a spear meant for him. Enraged at the loss of his son, Viggo seeks vengeance on the man responsible: Caolán’s father. As the chieftain breathes his last, Viggo vows to take Caolán as a slave to avenge Aulus’ untimely death. Torn from his country and people, Caolán’s only comfort is the hope that one day he will be able to avenge his father. But can the greatest wrongs be righted? Brotherly bonds, gladiators, old enemies, corrupt politicians and a young woman who captures Caolán’s heart, take a role in the physical and emotional journey that binds Caolán’s and Viggo’s fates together. Can the two wounded parties work past their hatred of each other and find what they have lost: a father and a son? This new novel by Hazel West, explores the familial ties that bind us all, whether by blood or by bond. As he was rounding the corner of the wall that ran alongside the graveyard he was suddenly grabbed and whirled around sharply. A fist was planted in his stomach and he was thrown to the ground violently, winded and choking for breath. His assailant kicked him in the side and he cried out as his wounds smarted. He tried to find his feet again, groping for his attacker, but he was hauled up and slammed against the wall, finding himself face-to-face with Amatus’ hooded lackey, a nasty gleam in his eye. “What do you want?” he gasped out but only received another heavy fist in the gut that made his half-healed wounds ache terribly. He thought several might have even re-opened from the treatment, feeling a bit of warm blood trickle down his side. Caolán looked past the lackey’s shoulder as he moved to one side, still holding Caolán against the wall with a hand to his throat. The Celt saw Amatus himself standing in front of him now, the slow smirk on his lips that Caolán had come to hate. He felt sick to his stomach, both from the blows and from that smile. “I apologize for Festus’ behavior, but I couldn’t think of another way to get you to listen to me,” Amatus continued and Caolán just glared at him.“What do you want with me?” he asked again, his voice hoarse. “I’m not going to steal anything for you,” Caolán told him and received another punch from Festus. He folded over, wheezing, as the lackey shoved him against the wall again, choking him with the grip on his throat. “I thought you would be difficult,” Amatus said with a smile as if that was what he had wanted all along so he could see the young Celt suffer. Hazel will be giving away one signed copy of By Blood or By Bond through a Goodreads Giveaway and a signed copy of her backstories collection to a lucky commenter during the blog tour. It you want to win the backstories collection, leave a comment with your name and email address and after the tour, Hazel will draw the lucky winner from her highwayman hat. a. Purchase a paperback copy of By Blood or By Bond through Amazon or Createspace, you can email Hazel at sirwilliamssquire@gmail.com with the subject “Blood or Bond” and notify her of your purchase. She will then give you a coupon code for 30% off a paperback copy of the backstories collection from Createspace. b. Purchase an e-book copy of By Blood or By Bond from Smashwords or Kindle send Hazel the same email, and she will give you a discount code for a FREE Smashwords e-book copy of “To Save a Life”. So, if you buy the book, don’t forget to email Hazel before the 31st of January, or you won’t get your coupon! If all goes, well, my first short story collection, In the Balance will be available in e-book format by the end of December. A fitting end to 2012 IMHO. (I just hope everyone else will agree.) The collection will include my first two professionaly published short stories and a novelette set in the same universe as my two novels, Daughter of the Goddess Lands and Shadow of the Horsemen.